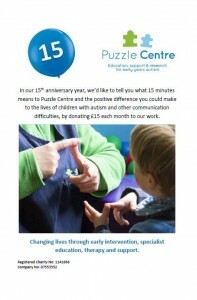 • By cheque: If you would like to make a donation by cheque, please make the cheque payable to Puzzle Centre Trust Limited and send it to Fundraising Manager, Puzzle Centre, Market House, 14 Market Square, Winslow, MK18 3AF. • Online: You can make a one-off gift or set up a regular donation here. If you are a UK taxpayer, Puzzle Centre can claim an additional 25p on every £1 you donate from HMRC, so please don’t forget to Gift Aid your donation. Furthermore, if you pay tax at the higher (40%) or additional (45%) rate, you can claim the difference between the rate you pay and the basic rate on your donation. Please download our Gift Aid Form and return the completed form to the Fundraising Team at Market House, 14 Market Square, Winslow, MK18 3AT. Give children with autism the best start in life by helping them to develop vital communication, social and emotional skills in their early years. Provide parents with information, guidance, practical and emotional support to help them understand and meet their child’s needs. Equip professionals, service providers and policy-makers with the knowledge, skills and tools to provide high-quality early intervention for children with autism and other communication difficulties. As a small charity with big ambitions, every penny counts. We need to raise at least £250,000 each year and your support means so much to us. Thank You!